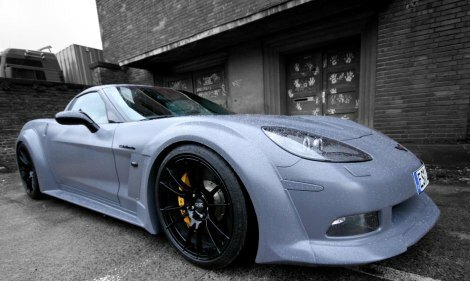 Uh-oh, the Euros are messing with our Corvettes. Seems there’s a tuning outfit in Germany (fancy that!) 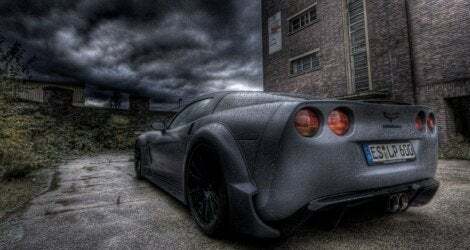 that goes by the name of LOMA-Performance, and they’ve taken a crack at that most American of cars (no, not the minivan), the Corvette, and made some improvements. Yeah, you sure got that right. Hey, guys, I got news for you. That’s a terrible name. Sure, I bet there’s a bunch of 14 year olds out there that will think it’s really cool, but most 14 year olds don’t buy cars. And actually, the second sentence in their press release reads like it was written by Borat Sagdiyev: “It is clearly reminiscent of the legendary Boeing Air Force One of the United States president – doubtless no accident by tuner LOMA-Performance.” Yeah, that seems deliberate to me too. 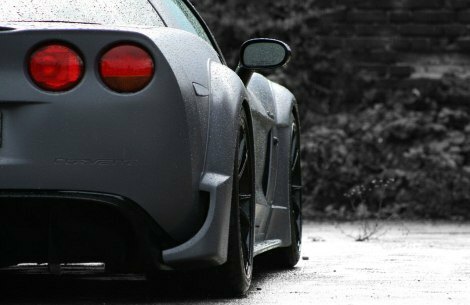 But OK, when you wade through the poor translation, just what makes the LOMA-Performance – Corvette C6.BlackforceOne so different? 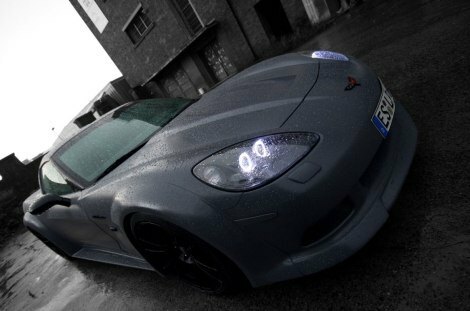 Well, for starters, you get three special paint jobs, either Stealth matte black, Eurofighter matte grey and White Storm matte white. LOMA will do other colors if you ask. LOMA has considerably re-worked the body. They’ve widened the body from the original width of 179cm to more than two meters at the rear to ” … creates a real masculine feel.” Yeah, OK, sure. 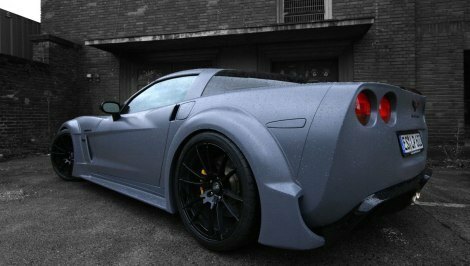 All that extra width comes courtesy of carbon fiber wheel arch extensions and carbon fiber side skirts. The buyer has the option of going either with or without visible screws. There’s also a carbon fiber front lip and rear diffuser with an integrated LED reverse light alongside the extensions, also in carbon fiber. There’s also a carbon fiber finish rear spoiler that seems to be detachable. And there’s also circular daytime running lights. Engine-wise LOMA has installed twin turbos that crank the V8’s output to 794 PS. That figures seems to be at the crank, but LOMA states that the power at the axel is 675 PS. All that power gets to the ground via a LOMA-Performance carbon fiber sports clutch, a carbon fiber drive shaft and an overhauled “gear unit”. No exact word from LOMA on just what the overhauling entails, and I’m assuming that “gear unit” means transmission. LOMA has also worked the suspension, natch, adding adjustable coilovers where you can tweak pressure and rebound damping. The whole shebang rides on Michelin Sport Cup high performance tires that are 275/30R19 in front and 335/25R20 out back. 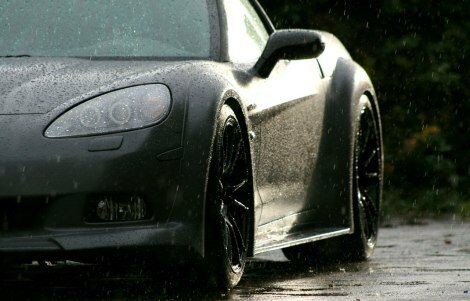 They’re mounted on 10 x 19 and 12 x 20-inch shining black OZ Racing Ultraleggera HLT alloy wheels. 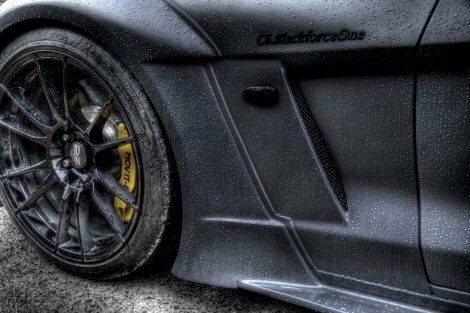 No Comments on "LOMA-Performance – Corvette C6.BlackforceOne"